As the holiday season get’s into full swing and we all prepare for Christmas and New Year’s Eve festivities, isn’t it time for a new modern dining table on which to host your fabulous holiday feast? Room Service has a vast selection of modern dining tables to suit every taste …… yum. Whether your personal decor style in modern dining tables leans more towards a Hollywood Regency style, such as our Bel Air Dining Table in high gloss white or Black Mirror Hollywood Dining table, or if your home is more mid century modern – you might prefer the Eero Saarinen style Oval table in Walnut or Saarinen style tulip Dining Table. Room Service modern furniture stores also have styles that are more transitional and can be incorporated into many other decor styles (for example the attached image of our French Farmhouse modern dining table , or brand new style Chrome U-Leg Macassar Dining table) so there really is no excuse to deck the halls …….. or dining room. Many in-stock items are available to purchase out of the showrooms today! Note : All of these styles can be customized and used as modern restaurant tables ……..
Room Service has a large selection of modern wing chairs, customizable to suit all interior and modern outdoor decor styles. Let’s get creative …………. If you work from home, or are considering a stylish revamp of your office space at work and need an inspiring, functional modern office space to be creative and productive look no further than Room Service’s collection of customizable office and organization pieces that you can use to build your dream space. 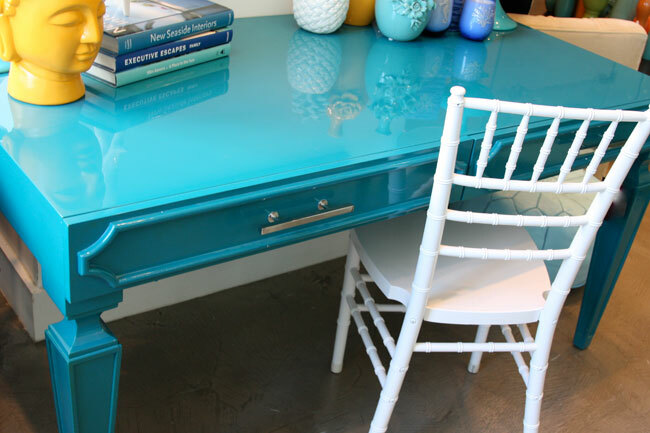 Offering modern desks and functional modern storage solutions in a variety of styles including mid century modern and the very popular and oh-so glamorous Hollywood Regency style. All these pieces can be customized in size, finish and detail to suit your needs. Add file storage to a modern credenza to create your own custom modern file cabinet, don’t forget to add a modern bookcase to your space. Modern Shelving can serve so many functions in your fabulous and functional modern home office space. Don’t be afraid to use bold pops of color, and always warm up your space by using wood ……. for the Hollywood Regency style spaces always add some sparkle by using chrome, lucite and mirror accents. Mirror is great in smaller spaces, reflecting light and giving the illusion of more space. So get creative and design your dream office space today ! …………..
Room Service offers customizable modern sofas in all shapes and sizes. There is something to suit every decor style including clean lined European modern sofa styles perfect for open plan loft living spaces, sophisticated Hollywood Regency style sofas for those with more glamorous taste in modern furniture and many options for those who love mid-century modern furniture and design. Today’s modern living room should include a few basic pieces: a stylish modern sofa, a pair of modern wing chairs to accent, a modern coffee table, and a collection of fun modern throw pillows to add personality and don’t forget modern lighting ……. the perfect pair of lamps, a modern chandelier or pendant light to illuminate from above. With all the fabulous customizable modern sofa styles Room Service offers, there is sure to be something for every eclectic taste, so design your own dream http://www.roomservicestore.com/store/sofas_and_arm_chairs/index.html today! For years designers have been looking to the past for inspiration for modern furniture designs. And what could be more inspiring than looking to the glamorous era of old Hollywood in it’s heyday. Hollywood Regency is style, sophistication, glitz and glamor, but revamped with a clean modern updated twist. Vintage inspired styles, finished in today’s freshest fabrics and finishes. Elegant sofas and arm chairs, with glossy lacquer painted legs, shiny chrome nail-head trim …….. luxurious velvets and patent leathers. Lots of black & white, accented with pops of bright hues and eclectic accessories that add the ornate look of luxury so reminiscent of old Hollywood starlet’s homes. Room Service Modern Furniture Store has so many pieces that fit the definition of Hollywood Regency style. Modern sofas and arm chairs in all shapes and sizes, that can be customized to work in a Hollywood Regency inspired space. Our Hollywood Sofa in charcoal velvet, is simple in lines, but the use of luxurious velvet and delicate button tufting adds the glam factor. 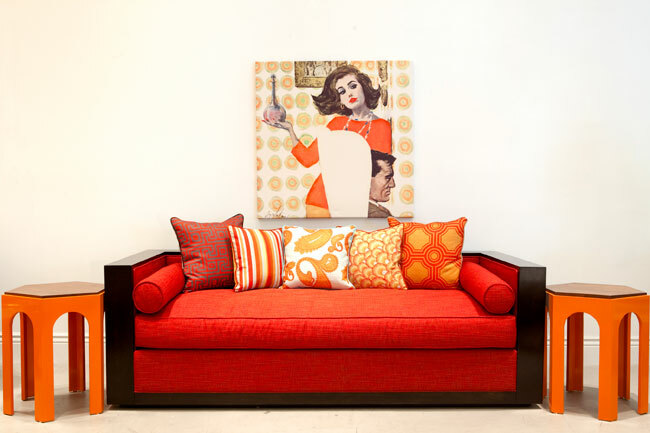 Or for those with a bolder color palette, go for the yellow tufted Hollywood sofa ………. in a vibrant citrus yellow hue. 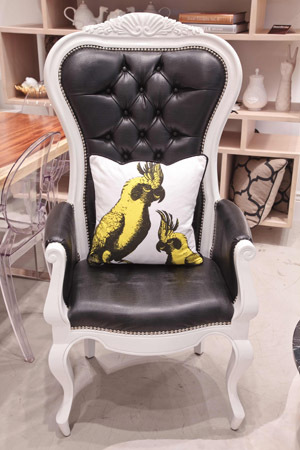 Another staple of Hollywood Regency style is Modern Wing Chairs. Our Riviera Wing Chair with arms is Hollywood Regency glam at it’s best, but is still a great piece of modern furniture. 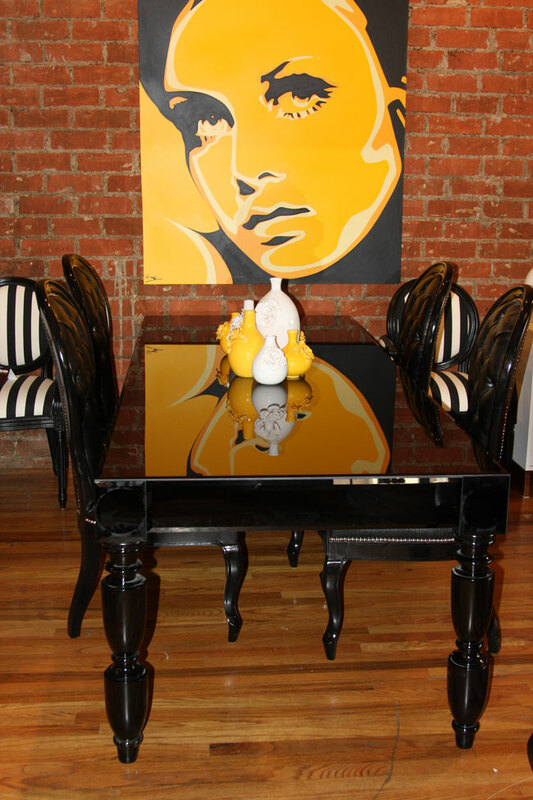 It features hand carved details and a fabulous glossy lacquer finish.